In this image, the red section represents Poncho's current primary chat topic, the weather. 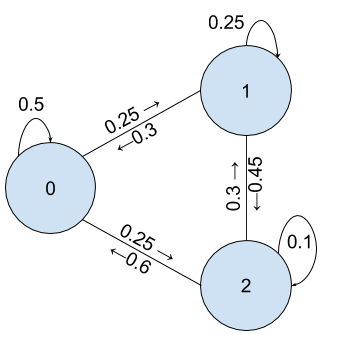 Nodes (or rules) are sized by the number of times people hit that rule - edges are directional, weighted (by the number of times a person moves from one rule to the next), and colored according to the source node. "...one can imagine a person walking randomly around a city. The city is effectively infinite and arranged in a square grid of sidewalks. At every intersection, the person randomly chooses one of the four possible routes (including the one originally traveled from)... Will the person ever get back to the original starting point of the walk?" For this network (30,000 people now, 10,000 people for each day, where the number in the node just indicates the ID of the node), we observe 1,444,562 transits for Node 0, 807,689 transits for Node 1, and 807,749 transits for Node 2. So far, these random walks are very merciful to the walkers. But we need to, unfortunately, start killing some of them. 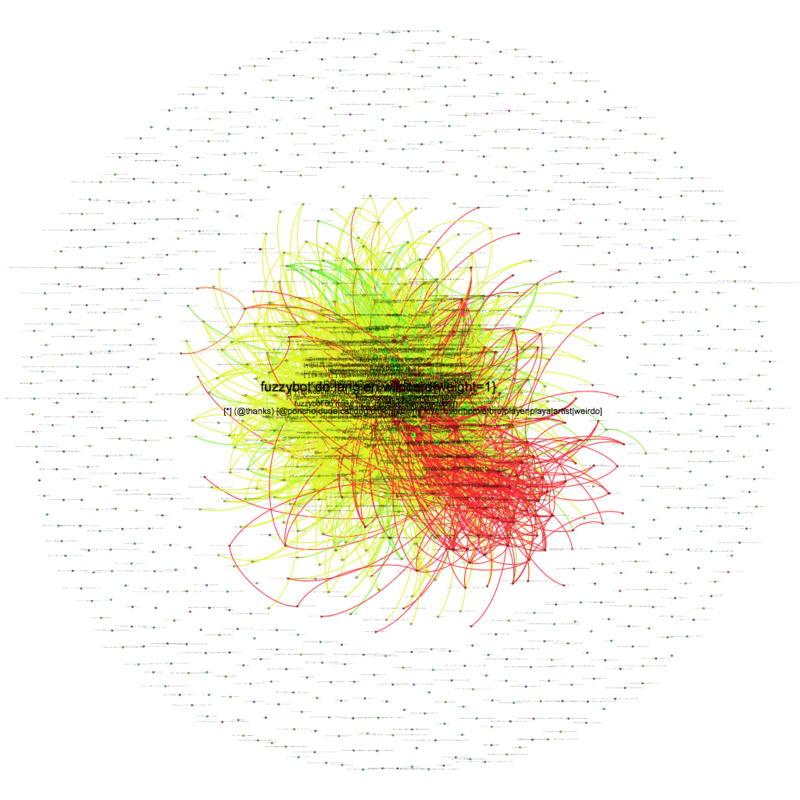 Going back to the context of what we're working on - we have a network where each node represents a rule that people hit when interacting with Poncho, and every outbound edge represents the next rules people will hit in their chain of interactions. At each interaction, though, some people stop talking to the bot - they "bounce" from the conversation, and we have lost them for now. So, in order to make our random walk more realistic, we will change our stopping condition, and add in this element where people stop talking to the bot - at every rule, we take (Number of people who left after arriving at this rule)/(Number of people who hit this rule generally) as the "bounce rate" or risk of the node. Every "day", or time step, we will "lose" some of these nodes at a proportion equivalent to whatever the risk rate is for the nodes that they're currently on. The simulation will end when everyone has ended their session. Additionally, people will start according to where most people start their conversations - most people will start with something like "Hello again!" rather than start in the middle of a deep conversation, so we will place them in the starting nodes proportional to the number of conversations that start on any particular rule. As you can see, we're also storing statistics about how many times people transit through the rules, the number of steps along the way, and the number of surviving walkers. We could also measure the number of transits through rules as we did in the very simple cases we talked about before. # comparison, which in turn will use num_trials+1 number of lambda functions to simulate the walks in parallel. As we can see here, we have some results (specifically, 36 interventions have surfaced) that are statistically significant and, 64% of the way through this analysis, they have together surfaced ways in which we could gain an utterly absurd amount of conversions (about 1,824.88% increase) for the rules we're interested in, and a 22.85% increase in total overall interactions. In other terms, if we were able to fulfill the fixes that have been provided, we would be able to very quickly make Poncho very very successful. While this helps triage how to make our bot better, can we use this type of random walk intuition to make our bot smarter immediately? If we have a map of the network as it stands right now, then we can act as if any particular user at any particular point is a random walker (although it's a real user), and just predict the most likely next rule the person will hit at any time. Just like with the random walkers, we should see some success, as the network is based on common behaviors, and we have no a-priori to think that any particular user is uncommon in their behavior - as a result, the network should reflect their common traffic patterns from step to step. For each user in this system, we'll arrange each step they took over time, from the first interaction to the last interaction. Then, we'll construct a network of all bot activity minus this single person's behavior - effectively, we're looking at how people behave without respect to each test person. Then, for each of these test people, for each subsequent step, we'll see if the most likely next step is the same as the next step for any particular rule in the network. Then, we'll transpose those guesses - effectively, we can say "for 1,000 randomly selected users in the system, how accurately can we measure them at their 1st transition, 2nd transition... nth transition?" 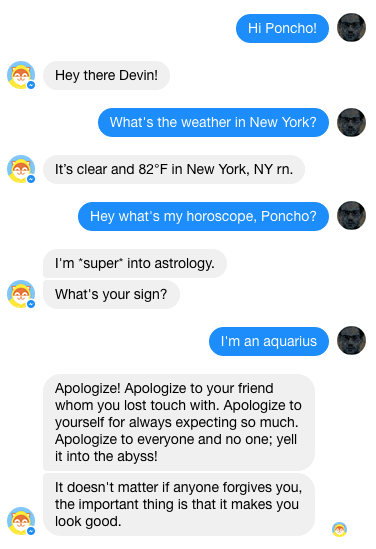 In fact, when we take a sample of 1,000 random individuals using Poncho, and play out every sequential interaction they have with the bot, and simply predict their next step based on the most common next step given all other data from all other users, we see mostly accurate predictions. The blue line shows us how many active users are still around over the number of interactions (where we play out from the first interaction someone has ever had out to the 150th, where we only have 10% of our sample still), and then we predict, at any point, that their next interaction will be whatever the most common next interaction is, observed from the rule-to-rule network we've constructed for our random walkers. In effect, we predict traffic based on previous observed traffic. And, our results show high successes in prediction- even though there's thousands of rules a person could theoretically hit at any time, we're able to accurately guess the rule they will hit 60-80% of the time. Of course, the results seem unrealistic - they kind of are. There are three shortcomings that should be addressed. First, it doesn't make assumptions about what transitions "mean" - in this world, it just sees that people move from Rule A to Rule D at a given rate, and doesn't know if that transition makes any sense, or should even happen that much. Thus, it can surface results that don't actually have a meaningful intervention when a person actually looks at the recommendation. Of course, it would be simple to programmatically filter those out through some human-curated process. Second, it behaves increasingly weirdly with increasingly rare events. If something has only happened once, it's hard to know what the "average" is - it's already very uncommon, so it's hard to get reliable estimates as to whether this is something that will ultimately happen at a predictable rate or not - and so it might wildly vary in terms of it's accuracy. These can also be filtered out relatively easy, but haven't been yet. Third, it only tests interventions in isolation. This is because trying groups of interventions would become computationally hard (imagine trying every pair, every triplet, and so forth - it becomes basically impossible). Indeed, if we were to act on any single one of these rules, we would likely see the results we're surfacing. When we pair some of these recommendations, it could have an effect that creates unintended consequences, however. Dealing with these three problems is a matter of further input from Poncho, or indeed any bot maker. They create some errors with the data, but can likely be mitigated to a large degree by having some mechanism by which bot makers can fine tune parameters to define the boundaries within which the analyses actually return results. Beyond those concerns, many of the recommendations being surfaced make clear qualitative sense, and this mechanism can act to automatically determine the minimal space where interventions would actually be efficacious in increasing growth and conversions. 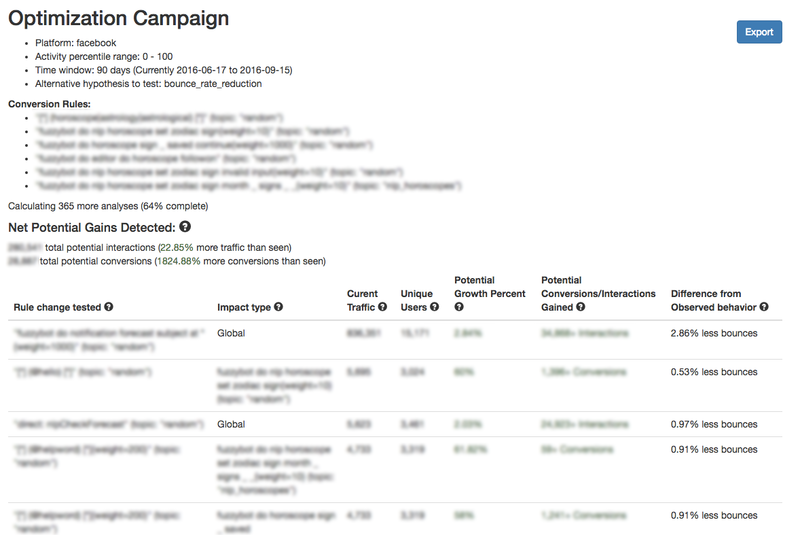 Beyond this specific implementation, there's many ways to adapt the general framework to a wide range of applications - we can simulate an infinite number of strategies for our users, and see their likely effects before we even run the campaigns. For example, we could consider a counter-factual design intervention where we give users some extra feature for referring new people, and see how many referrals we would actually need, and from which types of users, in order to smartly roll out growth campaigns. Or, we could similarly explore the effect of retention (or the likelihood to start up a new session) against various types of users (where we perhaps compare people that are very unlikely to return versus people who are very likely to return), and which types of users typically trigger conversions. In general, the network analogy extension provided above is sound, and modeling users as transiting through that network through the well-explored random walk methodology could make bot makers much more successful.